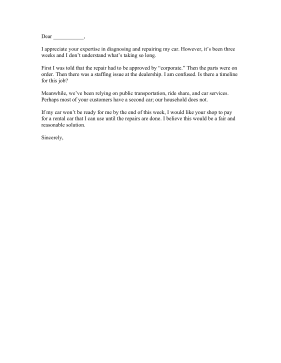 When auto repair shops take too long with a job, the customer can use this car complaint letter to request a rental car and faster service. I appreciate your expertise in diagnosing and repairing my car. However, it's been three weeks and I don't understand what's taking so long. First I was told that the repair had to be approved by "corporate." Then the parts were on order. Then there was a staffing issue at the dealership. I am confused. Is there a timeline for this job? Meanwhile, we've been relying on public transportation, ride share, and car services. Perhaps most of your customers have a second car; our household does not. If my car won't be ready for me by the end of this week, I would like your shop to pay for a rental car that I can use until the repairs are done. I believe this would be a fair and reasonable solution.